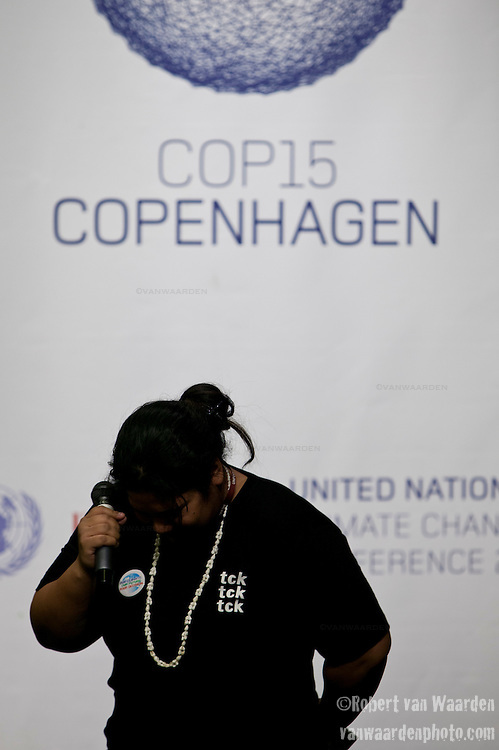 Leah Wickham, from Fiji, breaks into tears on the opening day of the Copenhagen summit. TckTckTck - an unprecedented alliance of civil society organisations - delivered its petition which more than 10 million people have signed, calling for world leaders to seal a fair, ambitious and binding climate deal at the talks. 15 young people from around the world held large scale "building blocks" which spell out "10 million people expect a fair, ambitious and binding deal" to show world leaders that all the elements required for an effective climate treaty are present. Young people from around the world handed over the petition to UNFCCC Executive Secretary Yvo de Boer and Danish Climate Minister and the President of COP15 Connie Hedegaard. Leah Wickham, from Fiji, spoke briefly on behalf of the 10 million people expecting a real deal at Copenhagen.